WARNING: Make sure you're holding a tissue or handkerchief before looking at these touching photos of a street kid feeding his sister. 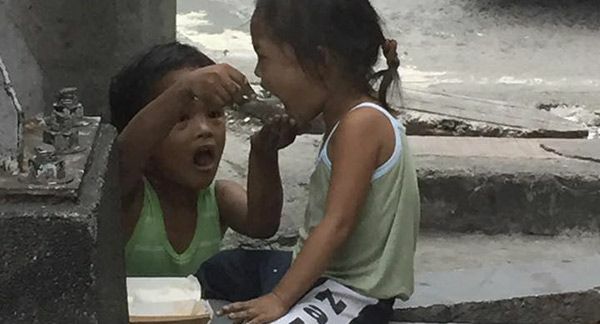 The pictures were taken by a kind couple, Geo and John Benedict Rigor, who gave the homeless children food after eating at a popular fastfood restaurant in Quezon City. "We had brunch at Jollibee (Retiro cor Mayon St.) today and my husband told me to buy another set of meal for a kid who asked him for alms.. and this is what we saw on our way out," Geo posted Monday, December 13, on Facebook. The viral photos, which unearthed a heartwarming scene where an unnamed boy is gladly feeding his younger sibling while sitting on a concrete barrier near the store, have so far amassed more than 6,000 shares and over 17,000 likes and reactions on the social networking site. It also generated comments from FB friends who were moved by the kindness of the couple and the smile of the poor boy that was fortunately captured on camera. Lawyer Almarius Payumo Cadigal said, "I am proud of you both. These pictures only show that indeed, children have the purest of heart and soul. 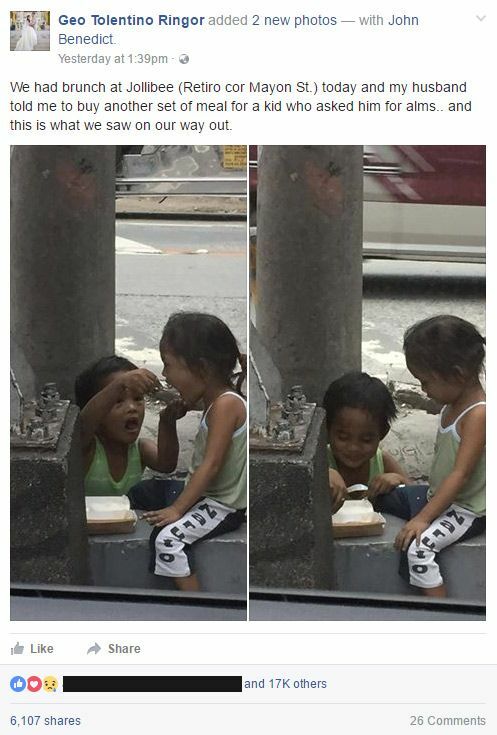 #notlosingfaithinhumanity"
Cathz Peralta posted, "The smile on kuya's face while feeding his sister... priceless." Nevi Cirujales Calisin commented, "I can feel the boy's happiness while he's feeding his sister.. Both of you will be blessed for making these kids happy." Jen Bermundo realised, "Christmas na talaga." As of this posting, the good samaritans continue to earn praises from their friends and other netizens. Have you done something like this in your life?